Introduction: Providing adequate and equal access to healthcare is a key goal towards achieving universal health coverage. However, social and demographic inequalities in accessing health care services exist in both developed and developing countries. This study examined the demographic and socio-economic factors associated with the lack of access to public clinics in the Greater Kuala Lumpur area. Materials and Methods: The study employed a survey involving 1032 participants. Data were collected using self- administered questionnaires distributed between October and December 2015 in the Greater Kuala Lumpur area. Results: Of the 1032 participants, 535 were public clinic users. A quarter (25.8%) of the users stated that they did not have access to public clinics in their residential area. A multiple logistic analysis showed that the elderly, the women, those from ethnic minority groups, those of lower family income, and the private sector workers were more likely not to have access to public clinics than their counterparts. Conclusions: The existing level of accessibility to public clinics could be improved by increasing the number of clinics. Clinics should be established to focus more on reaching the elderly, the women, the ethnic minority groups, the poorer families, and the private sector employees. T, Makmor et al. DEMOGRAPHIC AND SOCIOECONOMIC FACTORS ASSOCIATED WITH ACCESS TO PUBLIC CLINICS. 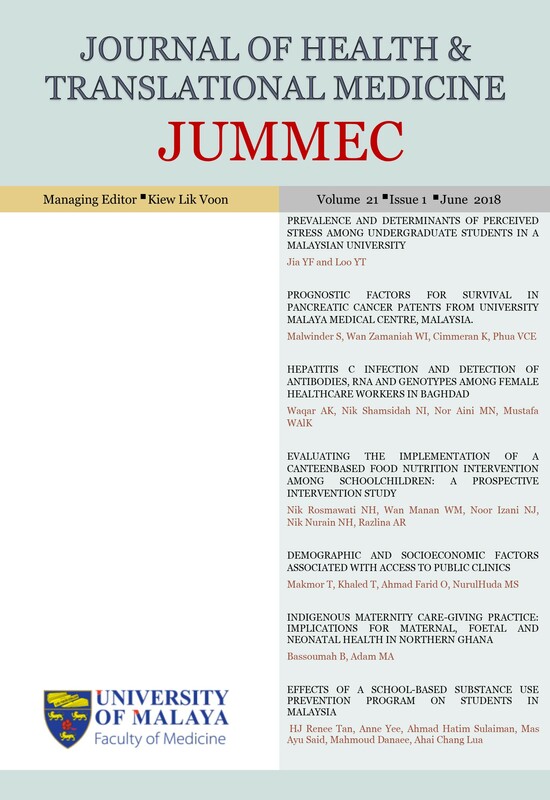 Journal of Health and Translational Medicine, [S.l. ], v. 21, n. 1, june 2018. ISSN 2289-392X. Available at: <https://jummec.um.edu.my/article/view/12194>. Date accessed: 21 apr. 2019.